For many years, Jack Ross was in a partnership with Allan Waisman. This firm amalgamated with another firm in 1964 to become Waisman Ross-Blankstein Coop Gillmor Hanna, later know as Number Ten Architects. Born in Winnipeg on 8 July 1928, Jack Jr. is the son of Gwendolyn and Jack Ross. 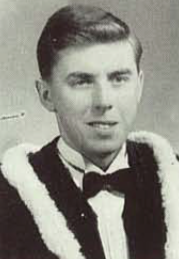 He attended Gordon Bell High School and then went on to graduate from the University of Manitoba with a Bachelor of Architecture in 1951. During his time on campus, he was recruited by John A. Russell to do theatre and set design for amateur theatre groups, a tradition which Jack Ross and Alan Waisman continued through the 1950s. It was a fortuitous time to enter the field of architecture, which was crackling with post war development mainly in the modernist style. Ross began his apprenticeship with Eric Thrift until March 1952, when he accepted a position with another local architectural practice, Charles Faurer, for whom he was a draftsman. He leapt into contention with the Manitoba Association of Architects (MAA) when in 1953, as yet unlicensed, he opened a practice called Waisman and Ross Architects. He and Waisman opened their office on 1 May 1953, and under dire threats from the MAA, Ross was ultimately registered on 13 November 1953. He had worked with Allan Waisman in Charles Faurer’s office, and had been three years behind him in university. The practice was quickly a success. A series of small town hospitals came their way through the provincial government in the mid-1950’s. The two men quickly hired three other architects, Ken Snider, Tom Nipper and Joe Kandrac. Using a team approach, each associate contributed to each project, picking out flaws and making suggestions. Wise in the ways of publicity as well as design, the two-year old firm submitted early designs to the Royal Architecture Institute of Canada (RAIC) winning an “honourable mention” in 1955 for the Hunter Memorial Hospital in Teulon. Their hospital plans were modest, constructed of concrete block, yet the Massey jury was enthusiastic about the Teulon Hospital: “This building is thoroughly remarkable and a trailblazer, as it provides well rounded medical facilities on a miniature scale at very low unit cost.” The exteriors were brightly colored, the interiors lit by sky-lights, each design reflecting new ideas. Their design for the Municipal Hall in St. Pierre designed and constructed under Waisman and Ross’ supervision, came in on schedule and seven thousand dollars under budget. Larger commissions followed, with a housing site co-sponsored by Central Mortgage and Housing Corp. and the School of Architecture and supervised by Waisman and Ross. The Winnipeg Builders Exchange followed in 1956, a compact office in the modernist manner at 290 Burnell Street. Artist Takao Tanabe installed a mosaic mural at the front entrance which depicted the history of the building. With outstanding growth clearly underway, the plan room and bid depository in the new office would mean the building would catch the eye of many visitors in the construction trade. Another major project for the young firm was also an “honourable mention” at the Massey’s, the Blackwood Beverages Bottling Plant, a distributor of 7-Up for Manitoba and Saskatchewan, located at 1850 Ellice Ave. The layout was unusual in that the office was separated from the plant by a glass walkway. The company later acquired bottling rights to Pepsi and Crush; the 1956 building was rebuilt in 1981 at a cost of $5 million, and little of its original look remains. The year 1957 saw Ross’s firm design the New York Life Building at 385 St. Mary Avenue. The RAIC Journal was suitably impressed with its broad horizontal sweep, the superstructure cantilevered a meter out from the foundation in a floating effect. The use of glass curtain walls and a glassed entrance makes the building inviting day and night. Waisman and Ross took the Massey silver medal in 1961 for their design of the Thompson Municipal Building. This structure contained the Fire Hall, Council Chambers, Police and Engineering Departments and Courtand was constructed in steel with a stainless steel curtain wall clipped to the frame. From 1961 to 1964, the practitioners partnered with a local developer by the name of R.C. Baxter, who represented a British investment firm named M.E.P.C. Canadian Properties, on four separate office buildings on Broadway. The IBM Building at 373 Broadway was first (added on to by Waisman and Ross in 1963), followed by Imperial House at 379 Broadway and the Premier Life Building at 360 Broadway, both in 1961. Britannia House, the best by far, was erected in 1962, at 338 Broadway. With upswept lines on a narrow lot, the design was enhanced by the landscaped strip which separates the podium from the sidewalk and is crossed by a small bridge. Alan Gowans called it “a good small exemplification of Louis Sullivan’s dictum that…the tall building should soar”. Baxter was impressed with his architects, noting that they were able to meet budget requirements by designing excellent buildings for given prices, and were “alert to the requirements of an investor like myself”. So alert that they formed a long-lasting and symbiotic relationship with Baxter, designing a 13-storey office tower in downtown Vancouver for him in 1965, Evergreen Place off Roslyn Road in 1970 and the twin-towered Summerland on University Crescent in 1971. In the meantime Waisman and Ross had built their own office at 10 Donald Street, with the signature cantilever over the foundation and a main pedestrian entrance off the Mid-Town Bridge sidewalk. Shortly thereafter in 1964, they amalgamated with Isadore Coop, Morley Blankstein, Doug Gillmor and Alan Hanna to form Waisman Ross Blankstein Coop Gillmore Hanna. Picking up from their address, they became Number 10 Architecture Group by about 1973. Meanwhile, Waisman and Ross had opened offices in Calgary, Regina and Edmonton, with several commissions now coming from out of province. The new partnership continued to be very successful through the sixties, with a variety of business and institutional commissions. Other highlights were Central Park Lodge, Thompson General Hospital, Mary Speechly Hall and Pembina Hall at the University of Manitoba, and another award winner, the Mendel Art Gallery and Conservatory in Saskatoon. The firm was also awarded “honourable mention” for the Kildonan Park Pavilion in 1968. In 1966, they designed Uni-City Shopping Mall, on Portage Avenue west. In 1969, Waisman Ross Blankstein Coop Gillmore Hanna designed the Manitoba Theatre Centre, a sophisticated massing in the “Brutalist style” of rough, untinted concrete. With a 785-seat auditorium, open lobbies, offices, a large workshop with a spectator window, dressing rooms and an orchestra pit, the building is complex and highly engineered. Doing away with any vestige of a proscenium, the stage is adaptable and even interactive with the audience. Its striking exterior was designed to stand out at night when most patrons attend its performances. The 1960’s were an active period for Jack Ross privately as well. In 1960 he married a dancer from the Royal Winnipeg Ballet, and built a new home for his family at 630 Cloutier Drive in 1964. On a river lot, it is a massing of several zones around an open glass-covered cross. The house is “married to the snowscape” he laughed, with a series of whites and near whites on the exterior and interior. One brilliant area in the centre of the cross is the sunken “conversation pit” before a fireplace in the living room. Ross was a member of the board of Manitoba Theatre Centre, Royal Winnipeg Ballet, Rainbow Stage, the Chamber of Commerce and a member of the Committee on Manitoba’s Economic Future. He was on the council of the Manitoba Association Architects and from 1965 to 1968 he chaired the MAA committee of planning and civic design. In 1967, Ross chaired the Professionals Service Export Mission to the Caribbean for the Provincial Department of Industry and Commerce. One of his great interests was good industrial product design. Jack Ross served on the board of The Manitoba Design Institute for five years before being appointed its chairman in 1971. This was a provincial body established to assist local industry to obtain professional design advice from a pool of experts, to improve their image, packaging and competitiveness. There were marketing clinics, seminars, and new product competitions as well as individual consultations with manufacturers. Markets were opening rapidly and demand was brisk. During his two-year stint as chair, Ross opened his own product design firm “Adapt”, which offered expert design assistance to help a product function and look better and, therefore, sell better. During this period, he was sharing his time with his practice at Number Ten, mindful that this sideline alone would leave him to starve. His practice was moving ahead with the design of the Northstar Inn, a high-rise hotel complex at 280 Portage Avenue, and Ross’ own design of the Kensington Building at 245 Portage Avenue. With 18 storeys of curving reflective glass, this slim tower replaced a burnt out landmark of the same name. Again using his signature technique of overhanging the building on its podium, this design method gave Ross the expanded square footage for the upper floors which made the building viable on its narrow lot. By 1973, his old partner Allan Waisman had moved to Vancouver to seek new opportunities. Ross had left Number 10 by 1973, and was managing his two businesses when he fell on hard times and was forced to close his practice in 1978. He had been inducted as a member of the College of Fellows of the Royal Architectural Institute of Canada in 1974. Sometime around 1978 he opened a new office called Core Plan at 219-60 Hargrave Street, an urban design studio that may have had its head office in Vancouver. Ross moved to Vancouver to work there for Core Plan in 1981, returning to Winnipeg a short time later. He has not been a registered architect since this time. “Blackwoods Beverages Bottling Plant.” Royal Architectural Institute of Canada Journal (September 1959): 298-99. Alan Gowans. Building Canada: an Architectural History of Canadian Life. Oxford University Press, 1966.